Toss - Chennai Super Kings won the toss and elected to bat. SIX! Karn Sharma to Jonny Bairstow. Leg spinner half volley, outside off stump on the front foot driving, well timed in the air under control over long on for 6 runs. That's how you win in style. Bairstow got the length he was looking for and drilled it back over long on. Sunrisers get a much needed win in their pursuit of the top four and it was a real team performance. The bowlers kept the runs down and then Warner and Bairstow set about chasing a small total and did it with ease. Not the best performance from Chennai but they hold a comfortable lead at the top of the table. Imran Tahir to Jonny Bairstow. Leg spinner full toss, to leg on the front foot working, to deep mid wicket for 1 run, fielded by Jadeja. One big change in CSK is MS Dhoni is not playing today, Suresh Raina will lead the side in the absence of Dhoni. Chennai Super Kings won the toss and Opt to bat first. Here is the Predicted XI for both the teams. Hello, all welcome to the IPL 2019 Sunrisers Hyderabad vs Chennai Super Kings Live Score blog. Catch Indian Premier League SRH vs CSK Live Score ball by ball commentary with fast scorecard updates, Results and much more. 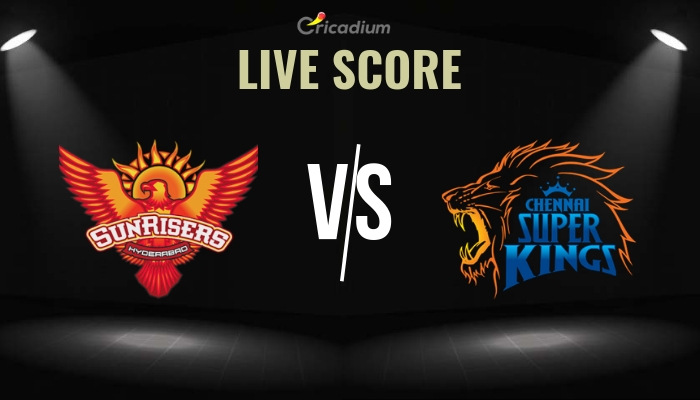 For SRH vs CSK Live Score ball by ball commentary stay connected to Cricadium.